Ok, so I've been stung by the Facebook bee. I swore up and down I would never be one of those people who got sucked into the online world of having a "page" of some sort on a social network. I mean, my blog was enough to keep me busy online, and why would I care about "catching up" with people I see all the time anyway. Those were the friends who kept sending me the invites to join Facebook. But after enough bugging from them, I decided to set up an account and check it out. Into the abyss I fell. It's almost like being Scrooge and seeing all the ghosts of Christmas past, present and future. Well, not in a bad way I suppose because I haven't encountered any bad-blood so to speak. I have no enemies, and there aren't too many people that I wouldn't be friendly too if I saw them on the streets. 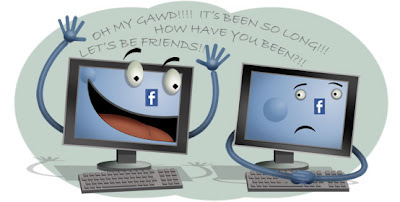 I have heard some friends say things like, 'oh gosh so-and-so found me on Facebook... then that awkward moment of receiving a "Friend Request" from someone you wouldn't have "Friended" had you seen them first. The question comes, do you say yes, or do you say no to their request? I think it's funny, and a little juvenile at best, but it's totally with the times. I hear the same issues with LinkedIn too, although that's probably more harassing because it is work related and people want contacts and whatever else. And they are probably not sharing photos, and giving status updates every few minutes. Speaking of, have you heard of Twitter? I have heard of it, but once again, it's one of those things I am saying I'll probably never do. Ask me again in a month and I will probably be "Tweeting" my little heart out. Ugg. What happened to my best friend from 3rd grade? Remember the ski trip freshman year - where did those crazies go? Where did all the families go that lived on my street as a kid? I wonder what so-and-so is up to now that they are an adult? Or even better, I wonder what ever happened to the kid that got his shirt stapled to his pants in 8th grade because it was always untucked (private school)? Well guess what? I know the answers to all those questions now, because of Facebook. I've been in touch with old neighbors, high school friends, pals from other schools, current friends, parents of friends, former coworkers, long-lost relatives. It's actually been pretty neat to see Where Are They Now in real time. It truly is the best little online blackboard for nosey creatures like myself. I love details, and I know just where to go to get them at my fingertips now! So, your neighbor Lynn told me she saw me listed on YOUR FaceBook page AND the page of a college friend, who happened to be a college friend of mine also, which made us realize we went to college TOGETHER. So there you go. Oh, it's also interesting to find pictures of my 20-year-old cousin drinking... a lot. Hey kids, think about what pictures you post - duh!